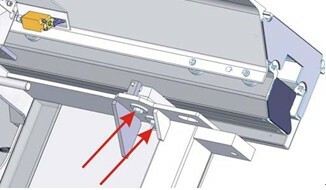  Place the bottom carriage on the machine frame and push against the stop screws. Screw on the bottom carriage. 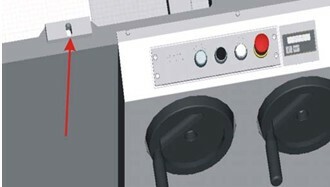 Place the middle carriage on the bottom carriage so that the interlock is pointing to the right. 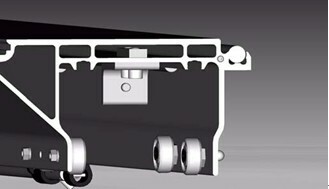 Push the middle carriage to the right so that the 1st double roller is still just resting on the round bars. Carefully push on the top carriage making sure it is not skewed. Carefully push the guide rails onto the double rollers. Push the top carriage towards the left, all the way to the stop. 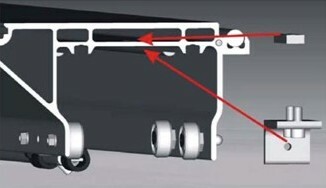 Check whether the stop on the top carriage and the stop on the bottom carriage hit the end position at the same time. Tighten the central fixing screw. Check the sub-rollers are correctly adjusted.